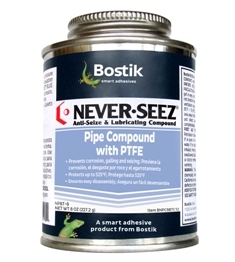 Never-Seez Pipe Compound with PTFE allows greater thread engagement and more positive sealing. This product prevents corrosion and galling of threads for easy disassembly at temperatures up to 525°F. Recommended for use on black iron, galvanized stainless steel and pressure steam pipes in contact with malleable cast iron, brass, stainless steel and galvanized fittings.